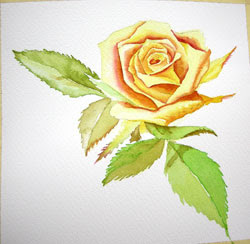 Last Friday in my watercolor class we worked on a simple rose. 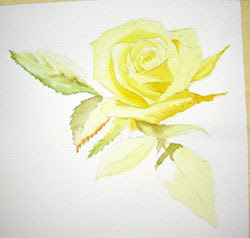 The actual photo reference was a peach-pink rose so we started our washes with yellows to bring out the oranges in the underpainted glazes. We continued to glaze on colors to develop the shadows and the soft textures in the leaves. The second picture here is about mid-way through. We added alizarine crimson to the shadow areas to build them deeper. The high contrast in lights and darks is what gives the flower depth. We also tried to pay attention to the hard and soft edges. The soft edges need to be touched with a damp brush to float the pigment into a wet area. The hard, crisp edges need to be applied on dry paper to keep the area sharp. If I have time I will continue to work on this flower and build pink glazes of color over the dry pigments to develop more of a peach colored rose. I am anxious to see what results some of my students come back with as they took these home to work on. To learn more about my classes and work please visit my website by clicking here.